I'm all about letting bread takes its time. You know that, right? Let it rise leisurely, so it develops the most flavor. I had beef brisket all ready to pretend to be Italian-style beef for sandwiches, but the only bread I had on hand was half a loaf of sourdough. Which is great bread - don't get me wrong. 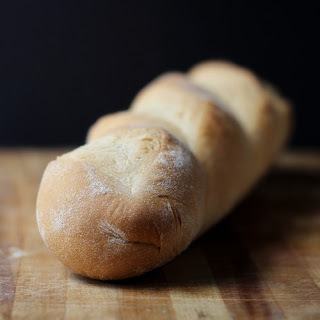 But I wanted something more like French bread. Oops. Not great planning there. But I knew I could make it happen. I knew I had some Red Star Rapid Rise Yeast (rises 50% faster!) so I decided to use that. Combine the water, sugar, and yeast in the bowl of your stand mixer fitted with the kneading hook. You don't need to proof this type of yeast, but there's nothing wrong with giving it a little head start while you assemble the rest of the ingredients. Add the flour and knead until the dough comes together in a ball and cleans the sides of the bowl and begins to get smooth. If you don't have a stand mixer, you can knead by hand. 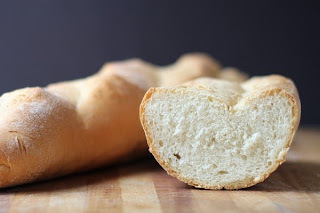 Add just 2 1/2 cups of flour and use the remaining 1/2 cup as you knead, so you don't end up adding too much flour and making a brick instead of a loaf. Add the salt and butter. If you're using a stand mixer, you can add the butter cold. The mixer will take care of it. If you're kneading by hand, it's better to have the butter softened. 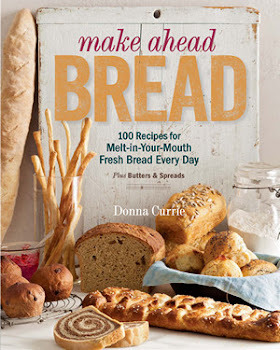 In fact, you might want to add it during the initial mixing of flour and water rather than trying to incorporate it after the dough has come together. But that's your choice. Continue kneading until the dough is very elastic - figure 8-10 minutes in the mixer. Cover the bowl with plastic wrap and let rise for 30 minutes. Flour your work surface lightly - this dough isn't super-sticky, so you won't need a lot. Turn out the dough, divide it in half, and form each half into a rope about 12 inches long. 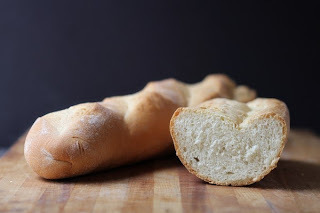 I use a baguette pan for breads like this, but you can bake these on a baking sheet or let them rise on a peel and transfer them to a baking stone to bake. Whatever you have will work just fine. Cover the dough with plastic wrap and let rise until doubled - it's fast - 20 to 30 minutes. While the dough rests, preheat the oven to 375 degrees. Get it heating as soon as that dough is covered. When the dough has risen, slash it as desired. I slashed one loaf lengthwise down the center, and the other got three diagonal slashes. Bake at 375 degrees until the bread is nicely golden brown - about 30 minutes. Let the bread cool on a rack before slicing. *I seldom check the actual temperature of water, but I know what it should feel like. In this case, put your finger under running cool water, and turn up the hot slowly until the water stops feeling cool and it just barely feels warm. You'll feel it. At one moment, if someone asked you how the water feels, you'd be positive it was cool. Then it will shift to warm. You don't want to wait until warm changes to really warm or hot. Quit at a temperature that won't murder your yeast. Let 'em have a nice last meal before the expire fat and happy in the oven.